In the late 1920s, it was called the Grosse Pointe Theater. It was on the corner of Charlevoix at Wayburn St. , one block from the city limits with Detroit. The original building still stands in fine condition, though it's painted a bright blue. It now houses Le Chateau Art Gallery. 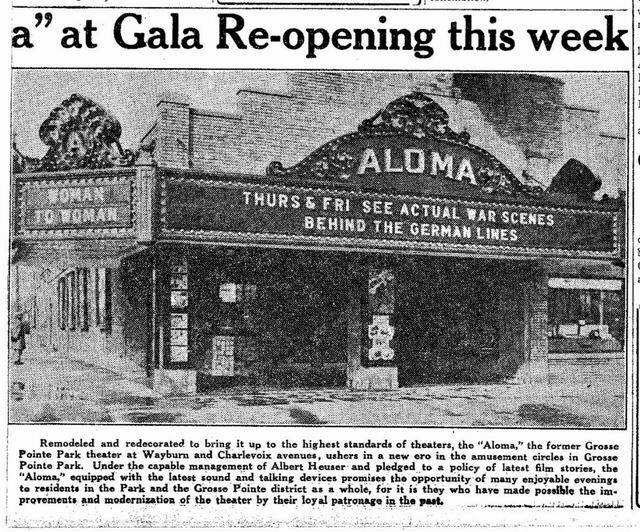 Opened as the Grosse Pointe Park in 1923, this theater was renamed the Aloma in 1930. It was closed in 1955, and today the building is used for office space. Cinema Treasures Link.